The French Railways Society is a non-profit-making society. We are a group of like-minded individuals interested in French railways, railway models, other transport and (usually!) France in general. 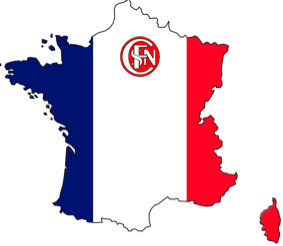 The Society was formed in 1976 as the SNCF Society to cater for the interests of British enthusiasts of French railways. The Society's original title was chosen as the most convenient way of expressing its aims, but following consultation with members was changed in June 2017 to the French Railways Society. The Society was the first of the UK continental railway societies to be formed and over the intervening years has built up a considerable library of books, railway journals and other material. With nearly 500 members, a number of whom live in France, we have a wide number of contacts covering most areas of interest. The Society produces a quarterly journal which is widely regarded as one of the best railway society journals in the UK. Each issue contains up to 50 pages or more of practical and lively articles on the present-day French railway scene, historical matters, modelling tips, travel hints, product and book reviews. It is well illustrated with photographs, scale drawings and track plans. The journal is published in March, June, September and December. It also includes a 'Stock Exchange' where members can advertise models and other items that are wanted or for sale. The website publishes a monthly News Page with a wide range of topical news covering both preservation and the current French rail scene. A list of charter train, railtours and other events in France is also available. The Members Section of the website provides details of the Society's archive and extensive libarary, almost certainly the largest collection of French railway books outside of France. The Society's archive includes a large selection of photographs and slides ranging from the end of the 19th century to the present era. The bulk of these have been digitalised and are available for viewing on-line. At present over 7,000 images are available on-line, with regular additions made. The members area also provides links to a large range of French railway videos dating from 1946 to the present day. The Society has a private members Yahoo Group where members can share information or seek assistance.